Thursday, 5th January 2017 marked the beginning of the new school year. All secondary students gathered for a formal ceremony at 7:30 am and 10:30 am for primary pupils at the swimming pool area. 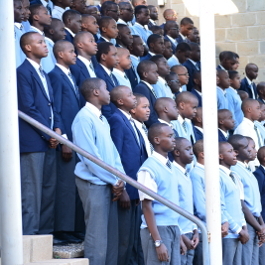 The Principal opened the school officially in both assemblies. He further welcomed the new students/pupils, teachers and the new assistant Chaplain. He thanked the school for the success in 2016 especially with the KCPE and KCSE classes. We wish the Standard 8 and Form 4 candidates success as they prepare for their final examination in November.